Never one to rest on their laurels, or to give social media marketers time to breathe, Facebook has announced several changes to the way the site will look on desktops. A new streamlined timeline is coming and there are also rumors of a business manager tool to make things easier for social media marketers managing business accounts. There will only be one column for posts on the news feed and that will appear on the right side of the page. The information that was formerly in the box under the profile image (such as store hours, maps, website URL, etc. ), will now be featured on the left hand column. The admin tools have been streamlined so they take up less space. They will be in menu options on the top of the screen. However, they won’t take up the block of space that they currently do on the admin’s screen. The Pages to Watch feature that some business owners have used to keep track of similar Facebook pages will be moved to the Insights. 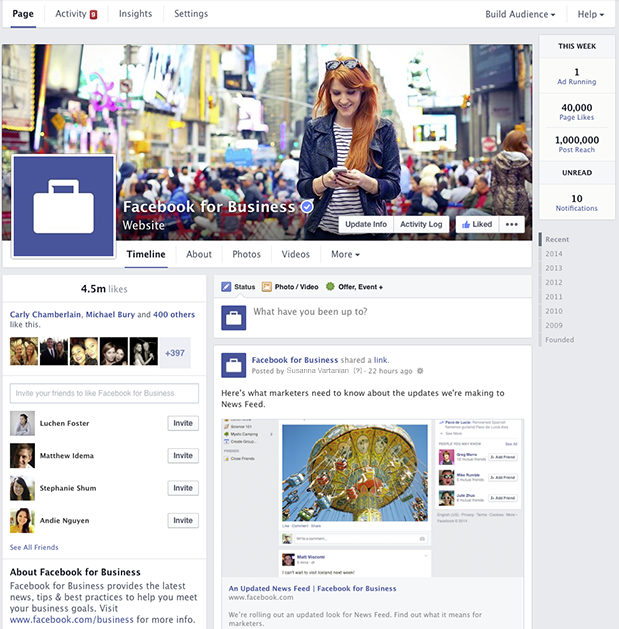 As the feature will be rolled out slowly, it may be a while before all Facebook pages are showing the new layout. However, Facebook has made it possible for page owners to add their pages to a waiting list for upgrades. In a less publicized move, Facebook has a new “Business Manager” tool according to TechCrunch. The tool will allow page admins to manage multiple pages and ad accounts in one interface. Information on the proposed tool is already available on Facebook, presumably to aid the partners who helping to test the system. There will be separate permissions available for Business Admins and Business Employees, one who can create and modify information, and one that can only view it. Similarly, there will be groups for Ad Account Admins, Ad Account, Advertisers, and Ad Account Analysts. According to the tipster that spoke to TechCrunch, the business manager is “an unlaunched product that hasn’t been revealed to the public. It went into “focus release” with a select set of clients a week ago, and will be fine-tuned before being rolled out to everyone”. Though no details on possible launch dates have been made available from Facebook. The changes to the timeline represent a major redesign that business owners will need to lto adapt to when planning their social media strategy going forward. The changes in the news feed alone means that marketers need to adjust image sizes and abandon highlight images that spanned both columns. Since the Facebook is rolling the changes out slowly, there’s a chance things may be fine-tuned before they are unleashed throughout the platform. With any luck, the changes to the timeline, coupled with the new business manager tool, will make the platform even more valuable to internet marketers than it was in the past.